Am I the only one who is looking at all of this bizarre merch and beginning to believe that Capcom hired Yogurt from Spaceballs to replace Inafune? Moichandising, moichandising! Where da real money from the games are made. Mega Man da T-shirt, Mega Man da coloring book, Mega Man da lunch box, Mega Man da breakfast cereal, Mega Man da FLAMETHROWER--the kids'll love this. i'd give a megaman coloring book to my little sister. she love coloriage and megaman would be a much better theme than disney princess. 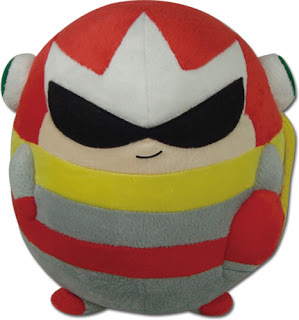 We can't have a Proto Man helmet, but we get this instead. Neat. You know, it's actually kinda cute. You have to admit. Why Protoman? That easily could be Toadman! lol! I would have been interested if it were a stress ball. This guy looks like a pokemon in that state. It's so dumb and yet hilariously cute at the same time. No no no, see, this is a tie-in to the new reboot, "Rockman NEXT." Instead of weapons, you get abilities from bosses that change how the player works. This here is what's known as the "Super Ball Form" ability (which is a reference to the Mega Man 4 enemies, "Super Ball Machine, Jr.").